A tremendous earthquake (estimated to hav had a richter scale magnitude of 8.5) hit the grapevine in 1857, causing extensive damage to the Fort. The first Butterfield Overland Stage stopped here on October 8th, 1858 on its way to San Francisco from St. Louis. 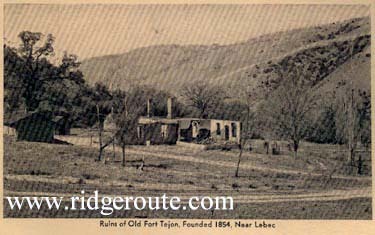 In 1926 along the Ridge Route the Fort Tejon area was a supply point having a garage, cafe and cabins.